ARSENAL fans are calling for the head of manager Arsene Wenger now more than ever and it is reported they are finally getting their wish. Arsenal put in a lacklustre performance in the Carabao Cup final against Manchester City on Sunday as they succumbed to a 3-0 defeat.Supporters and pundits alike have been heavily critical of the way the Gunners rolled over without any fight – just days after they were defeated by Swedish minnows Ostersund in the Europa League. The north London faithful have got their wish as Wenger is reportedly set to be axed at the end of the season. The Frenchman would still have another year left on his contract but his 22-year reign is said to be nearing its conclusion. The claim that a shortlist has been drawn up for potential replacements. And Germany international boss Joachim Low is thought the head up the list. However, the 2014 World Cup winner will not be available until after this summer’s tournament in Russia. 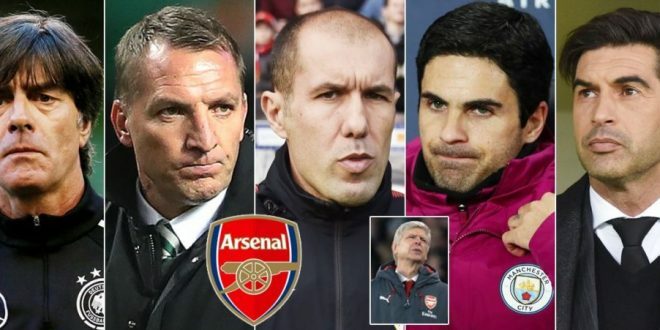 Celtic and former Liverpool manager Brendan Rodgers is also wanted, alongside Monaco’s Leonardo Jardim and Manchester City coach Mikel Arteta. There are also some suggestions that ex-Real Madrid boss Carlo Ancelotti could be in the running. But Arsenal legend Ian Wright would rather the club search for someone much younger. “The club need to start looking for somebody who is not old,” Wright told BBC Sport. “They are talking about Ancelotti, but they need to find the next one like Mauricio [Pochettino], who built his way up. Marco Silva stepped on his own ambition. “Somebody like that is good and can build, have a philosophy and be enthused with drive; someone who can bring in a player that can see his philosophy through, like we are seeing at Manchester City.” Wenger is willing to fight to keep hold of his job and see out the remaining 12 months. But the Arsenal hierarchy are only willing to grant his wish if he helps to secure Champions League football next year. The Gunners’ best chance is by winning the Europa League, but they face a tricky last-16 tie against AC Milan. It is highly unlikely Arsenal will finish in the top four of the Premier League as they currently sit sixth, 10 points behind Tottenham.